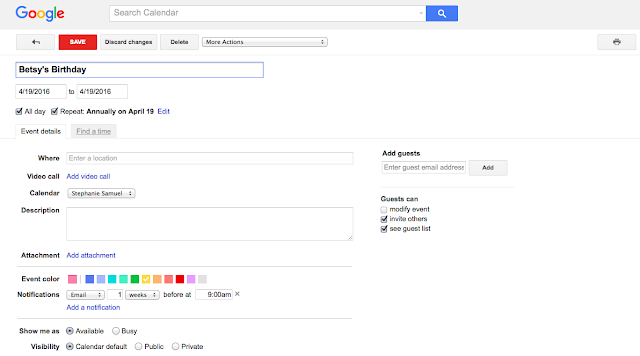 if you're an avid gmail user (as many of us are), i highly recommend getting use out of the google calendar that comes with it. 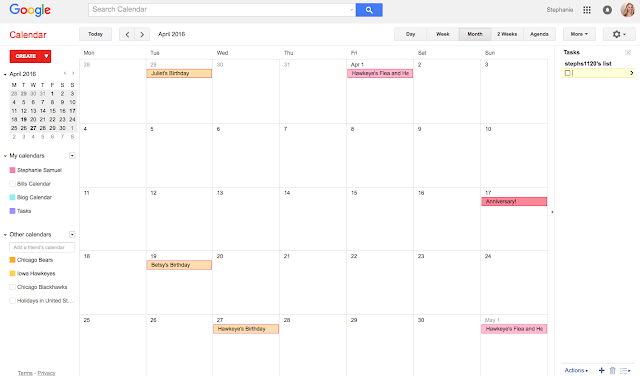 as you know, i'm a paper planner fan so i don't often check the google calendar - even though it's synced to my phone. i do use it to schedule doctor's appointments while i'm standing at the receptionist's desk but for weekly activities and to do list, i stick to paper planners. 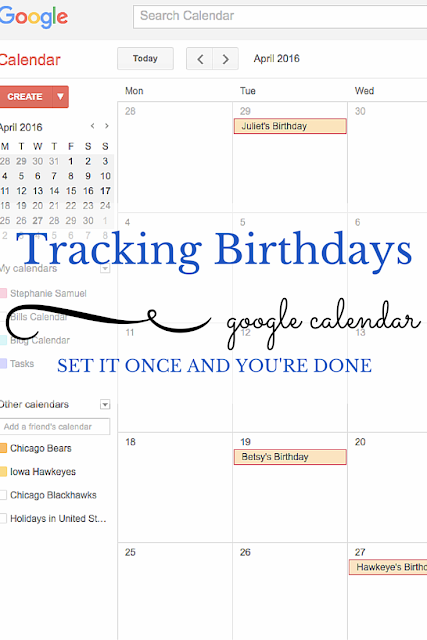 but one thing i do love using the google calendar for is tracking birthdays. once you enter someone's birthday, you can set it to be a repeating event, yearly. that way you just enter it once and it's on your calendar every year! you can also set a reminder, if it's a birthday you generally send a card or gift for. i set them for a week in advance. that way i get an e-mail to my gmail account alerting me that a birthday is coming up, giving me plenty of time to get and send a card, or to make plans for a lunch or dinner with nearby friends or family. and i don't even have to habitually check the calendar in order to do so. how easy is that? here's a view of my upcoming month of april (i hid the other calendars like my bills reminders and the blackhawks schedule, so you could just see the birthdays) click to expand it bigger. 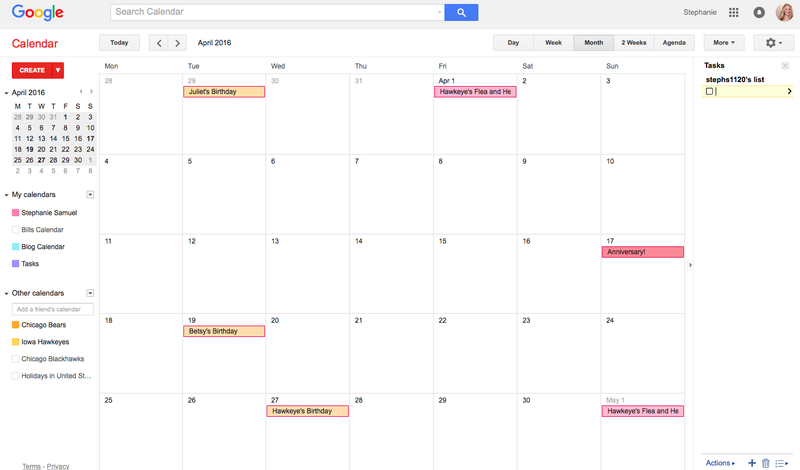 the 3 in yellow are birthdays, the things in pink are other things on my calendar. when you click a date on the calendar to add an event, this is how it looks. 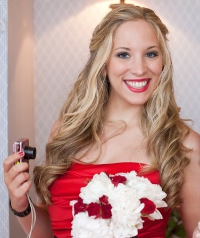 just enter the birthday, and choose to have it repeat annually on that date. then, towards the bottom, i personally change the color so i know at a glance that yellow is nothing but birthdays in my calendar. that's just a preference. and right under that is your notification options. as you can see, i've got it scheduled to remind me of betsy's birthday one week in advance, via e-mail. since i don't have facebook, i love this option to not only remind me of birthdays but also give me warning so i have time to plan things. and i only have to set it one time and it's done for years to come. what do you think - already use it? planning to try it? happy organizing.